Gaines baby number 5 is here, and everyone is happy and healthy. Learn more about the growing Fixer Upper family on HGTV.com. Joanna fashions a stunning cabin in the country for metal-craftsman Jimmy Don Holmes and his son Jake. The secluded country retreat features sleek, modern design and includes a stone patio and firepit. 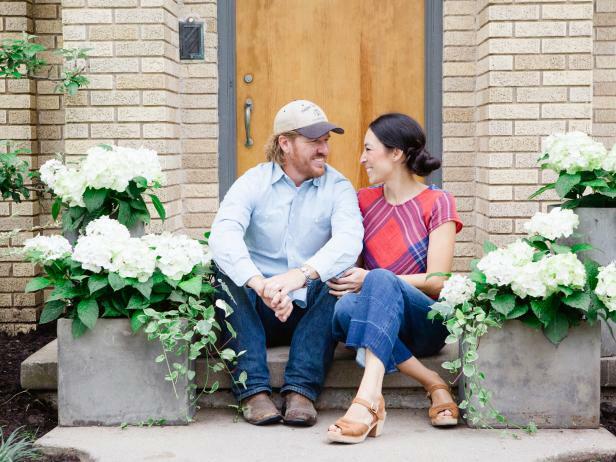 A new show with Chip and Joanna Gaines is now airing on HGTV. 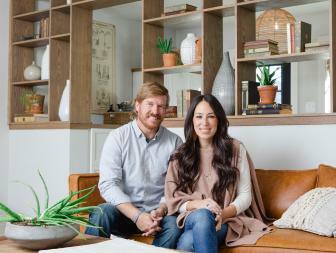 In this companion series to Fixer Upper, Joanna shares details on the design strategies, decorating and staging that go into the home-makeovers featured in the main series. It's more of a good thing, and something no Fixer Upper fan will want to miss! 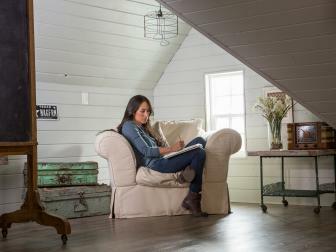 In this companion series to Fixer Upper, Joanna shares details on the design strategies, decorating and staging that go into the home-makeovers featured in the main series. 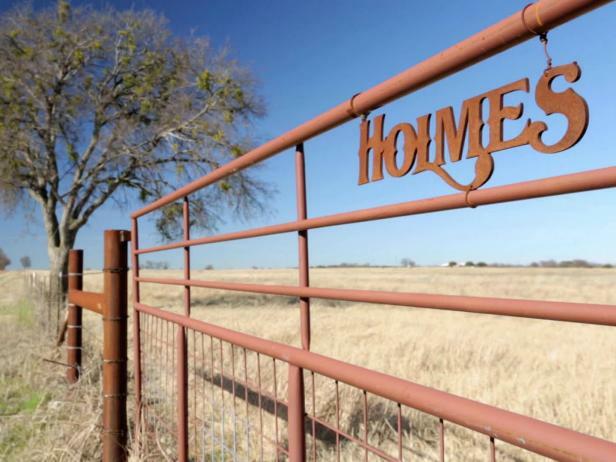 It's something no Fixer Upper fan will want to miss! Get more detail on your favorite Fixer Upper makeovers and see additional rooms and features not shown in the original series. Watch for #neverbeforeseen for rooms and items not seen in the original series. 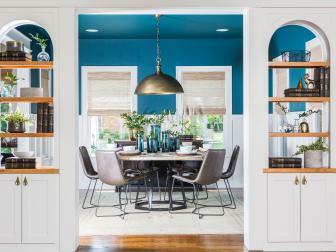 Miss an episode of Fixer Upper: Behind the Design? See Joanna's design strategy behind her and Chip's best builds right here, right now. 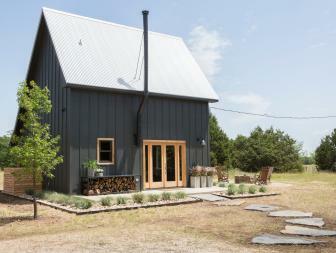 Joanna designs a stunning country cabin ifor metal-craftsman Jimmy Don Holmes and his son Jake that features sleek, modern design and includes a stone patio and firepit. 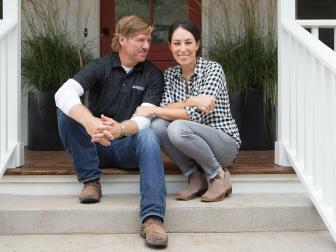 Check out video from HGTV's new Fixer Upper companion series, Fixer Upper: Behind the Design. Sometimes Chip and Joanna get a little too involved with their designs. Want something to whet your appetite for the new series? Let Joanna Gaines take you behind the designs of the original series in this web-exclusive video series. Joanna takes you through the renovations, room-by-room, offering design secrets, insights, recommendations and tips. Joanna Gaines works with her design team to transform the "Little Shack on the Prairie" into a couple's dream home. Jo works with her design assistant and local artisans to customize every last detail of the home and even incorporates a fun surprise for the couple's two young children. Joanna turns a little bungalow into a cozy cottage retreat for a woman after the passing of her husband. Jo gets to work creating a dream home with light neutral colors, natural wood elements and spaces to hang photos and memorabilia. Chip and Jo also surprise her with a charming and efficient powder bathroom. World-travelers Matt and Samantha call on Joanna Gaines to infuse Parisian style elements into their home's design. Jo works with her design assistant and local artisans to customize every detail of this home and even incorporates a fun surprise not featured in the original Fixer Upper episode. In the end, Joanna and her talented design team turn this couple's small, dated Tudor home into their Parisian-eclectic dream home. 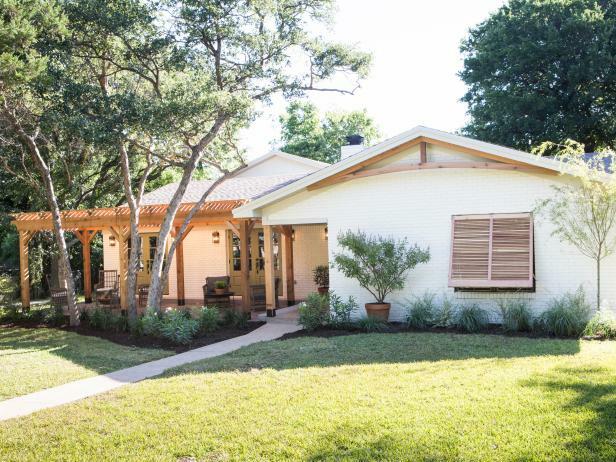 Joanna Gaines and her design team transform the outdated Ivy House into a one-of-a-kind forever home for the Jackson family. The homeowners have not one but two design styles they'd like incorporated in the house: rustic and coastal. 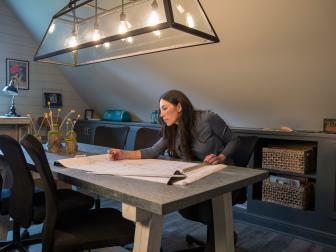 Joanna and her design assistant, Gretchen, work with local artisans to create a rustic coastal retreat for the Jacksons, and Jo reveals a truly unique master bathroom not featured in the original episode of Fixer Upper. Joanna blends the clean and simple look of Scandinavian design with the textures and patterns of Moroccan style in an 1890's farmhouse. She also finds a way to make the upstairs fit for five kids, adding a beautiful second bathroom and a cozy attic bedroom. Chip and Joanna help their friend turn a small house on his land into a youthful bachelor retreat for his son. Jo gives the home a modern mountain cabin feel with black metal and warm wood accents, pass-through kitchen windows and a rock fire pit. Joanna teams up with the Lee family to turn their outdated, plain-Jane house into a classic beauty. The Lees' mutual love for clean, traditional style presents a challenge for Jo, who must find a way to fill the home with the rich details and character they desire. 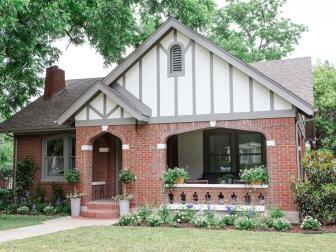 Joanna restores a 100-year-old home for the Herrera family. In addition to preserving the charm of the original house, they ask Jo to create a modern farmhouse-style design and implement a library wall as well as the number nine into the decor. Jo also surprises the family with a large bathroom for the kids and a finished attic space. 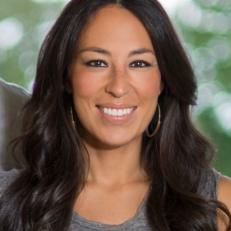 Joanna Gaines takes on a design challenge that's different than her usual fixer upper. The client wants to see her bland, industrial-style loft in downtown Waco converted into an industrial modern dream home. To do that, Jo and her team have to remove a lot of layers to reveal the space's original industrial elements and then add back in touches of modern design and decor. Joanna also reveals a custom closet that wasn't revealed in the original Fixer Upper. 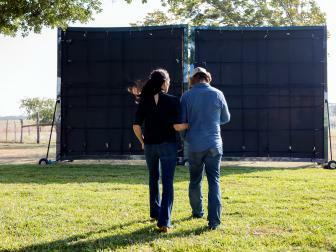 Joanna Gaines is tasked with creating a modern farmhouse design inside an old barn for a wounded veteran, TJ, and his girlfriend, Stephanie. Jo transforms the barn with modern elements, including concrete countertops, sleek black metal and stainless steel fixtures. She also reveals a never-before-seen guest bathroom.